For Boston's Predictive Analytics Meetup in February, I gave a short talk on using the python library NetworkX to analyze social network link data, illustrated with some simple D3.js visuals of the results. I've since spruced up the slides to stand on their own a bit better, extended a few of the examples, and moved it all online. 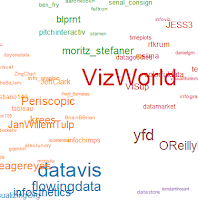 Here's a link to the zip file of the ppt, heavily commented code samples, and the network edgelist I used (from Moritz Stefaner's and my previous look at Twitter Infovis folks in mid-2011). Or you can browse the slides below (the links should work fine). Optionally here: Filter the network by some important attribute. 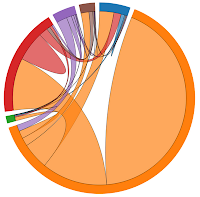 Optionally here: Filter the network further in the interactive visualization. Go back to (1) and add more stats. Or filter some more. In my previous post using Gephi to analyse the infovis network, I labelled one subcommunity "The Processing" crowd, another one "The Researchers" and another one "The Authorities." 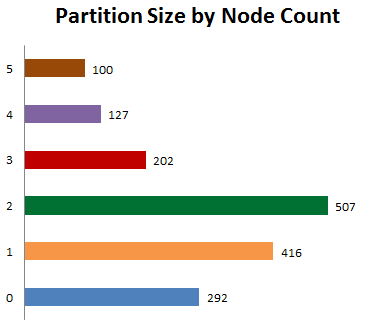 In my current analysis, where I find 6 subcommunities (or "partitions"), you can see them as roughly the green partition (Processing folks and infovis artists), the orange partition (the research/analytics group), and the blue partition (with high-degree authorities like infosthetics and flowingdata). The different demos make different things clear about this data, as you might expect! Once you get started making these visuals, you want to tinker forever... I hope the code samples and comments help you get started, if you want to try to do something in this line! Once again, talk slides plus source are in this zip file. Be sure to note my warnings and gotchas if you tinker yourself. 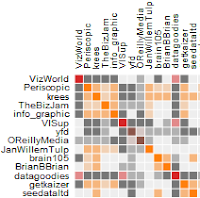 For a recent and different analysis of talk among the Twitter Infovis crowd, visit @JeffClark's posts here and here and here. (He's an orange, top N member in my graphs.) He identifies "red" and "blue" groups based on their interactions and words used. His two primary groups seem to correspond to the processing/artists (green) and researchers/analytics (orange) distinctions I found in this older data.